‘Should I worry?’ a friend in the Netherlands asked me. ‘It scares me that the PKK is right around the corner.’ She was referring to the arrest of 55 alleged PKK members in the Dutch province of Zeeland. They were holding a ‘secret meeting’, according to the police. I can imagine that’s kind of scary if you don’t know anything about Kurds or the PKK in Europe. This was not the first time a Kurdish gathering in the Netherlands was disrupted by police. In June of this year, seven Kurds from Germany were arrested in the small Dutch town of Zevenaar, also suspected of being members of the PKK. They were released after being interrogated. Except for one, but not because of PKK membership but because his papers were not in order. It’s very likely that this time too nothing will come out of the legal procedures. Of the 55 arrested people, 37 were released without charge after being questioned, nine were handed over to the immigration police for not having the right papers, and nine were kept in custody. The chance of a solid case being built against them is small. No weapons were found, there was no military training going on, there was not even mention of ‘propaganda material’ this time. Ties to the PKK will be very hard if not impossible to prove. It was, it seems, just a meeting of a Kurdish group. 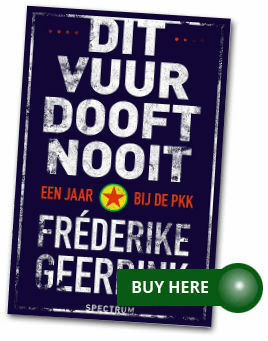 In a press release from FedKom, an umbrella organisation of eight Kurdish groups in the Netherlands, is was stated that there was nothing secret about the meeting and that it was even publicly announced. FedKom is not an obscure group, you can just visit the website (well, in Turkey you need a trick to get around the censorship). There you can see for example that they are part of the biggest organisation of Kurds in Europe, the Confederation of Kurdish Groups in Europe, Kon Kurd. You can visit Kon Kurd online too –in Turkey, access to this site is also blocked. Does this mean that the concerned organisations have nothing at all to do with the PKK? No. Fact is, to become the biggest federation of Kurds in the Netherlands and be part of Kon Kurd, you have to support the PKK. Why that is so can be explained by going back in history, to the years when the PKK was founded, in 1978, and after it carried out its first attack, in 1984. Those were also the years when many Kurds (and other people from Turkey, mainly leftists) left Turkey as refugees. After the 1980 military coup, human rights were violated on a huge scale. Kurds were one of the groups that endured heavy torture in jail, random arrests and capital punishment. It was the climate in which the PKK emerged and planned its first attack, and in which the organisation not only focused on the armed struggle in Turkey, but also on creating a support base, both in Turkey and in the growing diaspora in (mainly) Europe. Representatives of the PKK travelled to Europe, set up support bases and also recruited fighters. Those days saw the origins or Kurdish groups in Europe. In those days, you could only organize yourself successfully as a Kurdish community in a European city or country if the PKK supported you. Without that, you wouldn’t, for example, get financial support. Kurdish groups that were already there in Europe were quickly overshadowed or taken over by PKK-affiliated groups. That doesn’t mean that in general people were pressured and thus not willing to affiliate themselves with the PKK. The support was really there. The Kurds in the diaspora were the ones who had directly experienced the brutality of suppression, and the PKK made great effort to teach people about the history of Kurds and their oppression in Turkey. The PKK was the first organisation to stand up for Kurds since the Dersim uprising in the late 1930’s. Not much imagination is needed to understand why the support for the PKK grew fast. So, the PKK and Kurdish civil society in Europe have their origins in the same time and circumstances, and hand in hand they grew to be important factors in Turkey and Europe. And how was Europe doing at the time? There was a lot of leftist activism, and in general there was support for suppressed people. The PKK was not on any terrorist list, as it is now, and not banned. There was sympathy for the Kurds and their plight. Subsequent governments, at least in the Netherlands, did nothing to obstruct the work of the PKK and the organisations affiliated with it. Not in the nineteen eighties, and not in the nineties either. In 1995 the Dutch government allowed the establishment of the ‘Kurdish Parliament in exile’ in The Hague. Turkey was furious, because they (justly) stated the Parliament was closely tied to the PKK. However, Dutch PM Kok referred to the freedom of assembly and the freedom of association, both anchored in the Dutch constitution. He stated: ‘Shoving our constitution away to please a friendly nation would be the beginning of the end’. The biggest change between now and then is that in 2002 the PKK was put on the EU’s list of terrorist organisations. That move was the beginning of the new way Kurdish communities in Europe were approached. All of a sudden, they were no longer just groups that were free to assemble and associate, but also potential helpers of the PKK, in financing them and in recruiting people for ‘the mountains’. There is no denying that the Kurdish groups in Europe collect money for the PKK and that (some) new fighters do come from Europe. Kurds donate to the organisation, both voluntarily and under pressure. It is estimated that every year millions of euros are collected. This money is redistributed to not only the armed wing fighting in Turkey, but also to affiliated media and other organisations. It is, however, extremely hard to prove any of these funding methods. In the meantime, these Kurdish groups engage in all sorts of other activities, from folk dance and music to demonstrations, campaigns for the freedom of Öcalan, debates about a variety of social issues, and so on. In Turkey, too widely interpretable terror laws cripple the Kurdish political movement. Engaging in politics, legal activism and journalism, has landed thousands of peaceful Kurds in jail. The PKK and the Kurdish political movement have the same grass roots and the political movement can’t and wouldn’t exist without the PKK, but Turkey fails to recognize that peaceful activism is fundamentally different from using arms. By not making that distinction, Turkey shows itself to be far from being a democracy. By having the PKK on the list of terrorist organisations and by subsequently criminalizing Kurdish groups that engage in peaceful activism, Europe (and in this case specifically the Netherlands) is on the slippery path of eroding democratic values as well. People have the right to associate and to assemble, even if they share common goals with the PKK and also if they support them with words – like I said, the prosecutor doesn’t have a case without proof of activities like financing the PKK or recruiting new fighters. Just like in the eighties and nineties – those values should never change. In that light, the words of former Dutch PM Kok are still valid: ‘Shoving our constitution away to please a friendly nation would be the beginning of the end’. So, should you worry? That, and if so about what exactly, is for you to decide. Thanks to Wladimir van Wilgenburg for valuable advice.